fantumfan2003 wrote: Got my copy today from Abhinav Futuristics Limited. Took seven days to reach Mombai. Came in very well packed. Hats off to the staff. I'll try and do a review later if I can. Abhinav ripped you off man, i paid 3700/- including shipping from Manohar books. did not noticed this topic before. Once I asked Abhinav Futuristics Ltd regarding "Ways of the Rifle 2009" Edition, Below are the reply from them, Bank A/C and Phone number suppressed for security reason in open forum. After receiving the payment we’ll send the book through DHL or Normal mail (as desired by you) & dispatch details through e-mail immediately. We hope the great book full of knowledge is useful for you. I found it cheaper here and I bought the same from Champion Shooters Supply for 60$, Thats the cheapest price I got over net. From the picture it looks like they are specially printing that Indian Edition for India. In my opinion the book well deserved and worth the price. So anybody interested in serious ISSF style may consider buying it. I knew, I was being taken for a ride, but had no choice at that point in time. Rifle Shooting by Launi Meili should be the first book to refer to. Its has a better flow which novices can grasp easily. Here is my micro review of the book. WotR2009 has a lot of info but its layout is severely cluttered, its choice of font, size and colours are so bad that it has everything going wrong for it. Most users will not want to refer to it. It is a very reader unfriendly book packed with a lot of info though, which one will discover in bits and pieces on his journey through air rifle shooting. Just ordered "Ways of the Rifle 2009" and "Air Rifle Shooting" from intershoot.co.uk £36.00 each + £32.00 for shipping. Also enquired about them on Manohar Books but they said that the books are not published anymore. No reply from AFL, it was the best price I was getting anywhere on the net. I'll let you guys know my thoughts on the books..
After placing the order on 18th of August I got the books on 28th of August.. 10 Days.. Excellent.. I had a brief look and I must say that all the information is very detailed. Any of these books is a must have for a serious rifle shooter. I'll try to post more about the books after having a good look at them. Does this book contain detailed information on 10m air rifle shooting? 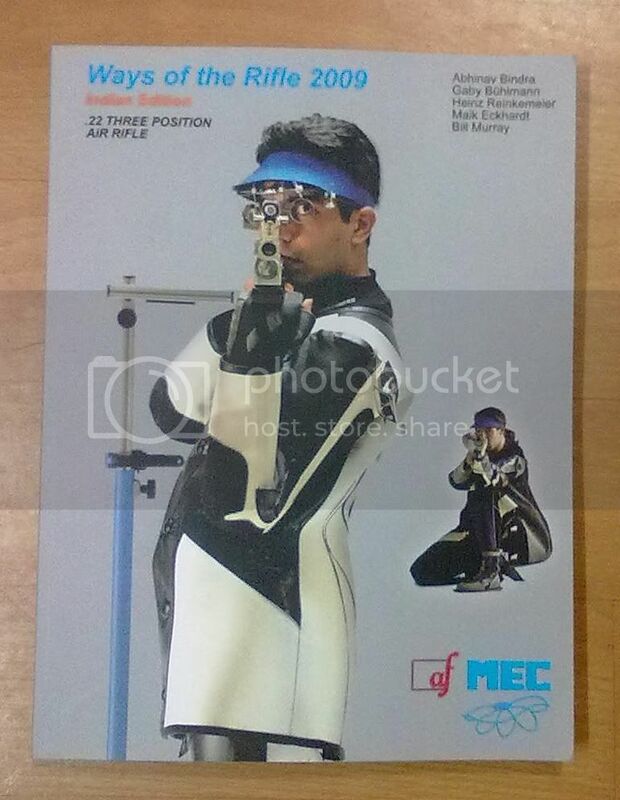 Or should I buy air rifle training + competition by the same author? Let me see If I can trace some connections back to Canada, US or Dortmund!